What kind of home would be best for me: We are seeking a home with an experienced dog owner and someone who is home more than they're away. Maverick is incredibly shy and cautious about people. He is also a known resource guarder who will snap if he is surprised. Given this, he needs a very experienced owner where there are no children in the home. 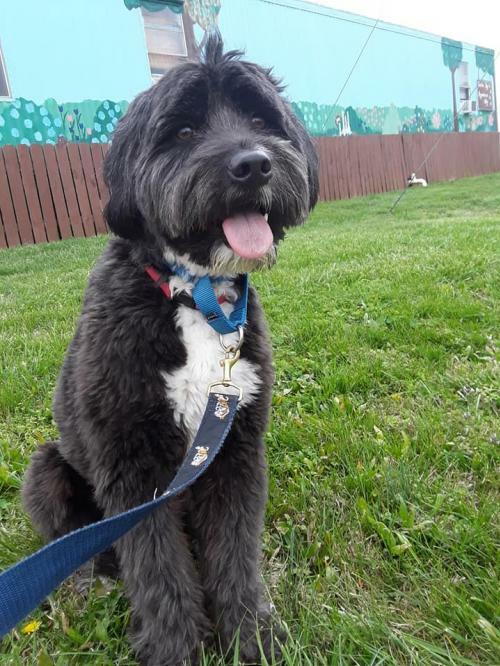 What is my personality like: Maverick is a quiet boy for an 18 month old labradoodle. He enjoys going on walks, but is never interested in being far from his people. Maverick is slow to trust. When he trusts you, he trusts you completely. But earning this level of trust takes a while. Maverick is very cautious about new people. He is not a dog that a stranger can walk up to and pet. He is also unpredictable with children. We believe that Maverick has a lot of positive personality to show. He is working on overcoming his fears, but it is a process. Maverick needs a very patient and experienced owner who will work with him. He also needs a home where there are few visitors and where he can live an active lifestyle. How do I act when I first meet new people: Very timid. Maverick is working on building confidence, but is very shy when he meets new people. Tips and Tidbits: Maverick can be a great dog in the right home. He needs a patient, experienced owner who will give him a chance.